AT&T will roll out 5G service in a dozen US cities Friday, becoming the first carrier to get the new higher speed cell service up and running. According to axios.com, there’s a catch (of course.) The service will only be available by mobile hotspot…with 5G capable phones not due out until next year. The blindingly fast service will initially be available in Atlanta; Charlotte, N.C.; Dallas; Houston; Indianapolis, Jacksonville, Fla.; Louisville, Ky.; Oklahoma City; New Orleans; Raleigh, N.C.; San Antonio; and Waco, Texas. In the first half of 2020, AT&T said it plans to add service in parts of Las Vegas, Los Angeles, Nashville, Orlando, San Diego, San Francisco and San Jose, Calif. The hot spot isn’t cheap…$499 with data service running $70 a month for 15 Gigs of data. With the present US Administration looking at relaxing regulations to help out the oil and coal industries moving to make gas vehicles cheaper, the car makers can see the writing on the wall, and all are going full throttle toward electric vehicles. Engadget.com reports that VW’s I.D. EV will give you 300 miles of range on a charge, and will sell for the price of a modern Golf diesel, which ranges between $24,000 and $32,000. The ID will be unveiled next year, and be out by 2020. VW says they will have a Tesla-like ordering system, where you can ‘build’ your car online, and get it spec’ed out like you want it, within the parameters of offered options. With both Amazon and Google announcing big expansions into the New York City area and near Washington, D.C., and Apple announcing a new facility that will make them the largest employer in Austin, TX, a new study is out showing…surprise…tech continues to be even more concentrated in major cities. Geekwire.com says a study by the Brookings Institution shows that the top 10 cities producing the biggest share of digital services account for 44.3% of ALL tech jobs. Nearly half the new tech jobs between 2015 and 2017 were in the top 10 cities…and just FIVE cities captured 34% of all new digital services job growth: San Francisco, Seattle, San Jose, Los Angeles, and Atlanta. At least when it comes to jobs, the digital divide between urban and rural areas is continuing to widen, and shows no amount of slowing. The application went in last spring, but yesterday, Google’s Waymo got permission from California to start testing driverless cars on public roads. 9too5google.com notes that Waymo was already operating in 25 US cities, but always with a safety driver on board. Waymo will start initial testing in Mountain View, Sunnyvale, Los Altos, Los Altos Hills, and Palo Alto…all near the Google and Alphabet campuses. The DMV permit allows for day/night testing on city streets, rural roads, and highways with posted speed limits of 65 mph…so pretty well anywhere in the above communities and their surroundings. Perhaps Waymo should strap in a realistic dummy to make other motorists feel more comfortable! With the move to electric vehicles, a number of auto makers are partnering with others. Toyota has hooked up with Subaru and BMW, for example, and now Ford and Volkswagen may be teaming up. Cnet.com reports that Ford and VW may share a platform for EVs. VW had previously said it might open up its MEB platform to others. Ford and VW had announced a ‘memorandum of understanding’ about possible collaboration last summer. Ford had previously announced that it would be bringing 40 EV models to market, and that it was investing some 11 billion in electrics by 2022. As long as we don’t have a Musta-Beetle or the like, all will probably be well with the EV world! After their big show yesterday on iPads and Macs, Apple dropped iOS 12.1 and watchOS 5.1. Now, according to zdnet.com, they have pulled the Watch update. It was apparently bricking the newest, greatest Watch Series 4 models. The Watches just stopped booting at the apple logo, and couldn’t be force quit or rebooted, even if unpaired from an iPhone. Many users attempted to take the devices into Apple Stores, but most were out of Series 4 models, and they are being shipped from overseas by 3 day air. Apple says it is a very small number that were affected. Researchers at Berkeley Lab have developed a process that can turn sunlight and water into electricity AND hydrogen! Engadget.com says its an ‘artificial photosynthesis’ process, but a big step up from previous attempts…going from 6.8% to 20.2% efficient. The team is moving into experimenting with real-world applications of the tech, but both electricity and hydrogen (for fuel cells) from one source could be a giant step towards more clean energy. Chinese smartphone maker Xiaomi has announced a new sub brand called Pocophone, and released a new model F1 smartphone in India. The interesting thing about it is that the phone sells for $300, but has the power of a Qualcomm Snapdragon 845…the present top line processor used in flagship Android phones. Not only that, the phone has 6 gigs of RAM, 64 GB of storage, and a 6.18 inch LCD screen at HD+. What about the battery? 4,000mAh. Right now, there are no plans to bring it to the US, unfortunately. A lot of people would love flagship phone power for $300 instead of $800-$1000! In a repeat of earlier cheating for ad photos, Huawei has been caught using a pro DSLR camera’s pics and passing them off as being from their Nova 3 smartphone. Arstechnica.com reports that one of the actors in the shots posted some behind the scenes photos from a shoot to Instagram, and you can see the DSLR on a tripod shooting the actual shots. VW has gotten an order for 1600 electric trucks from Ambev’s Brazilian brewery division. According to electrek.co, the beer maker will convert a third of their fleet to electric by 2023. The vehicles will start being delivered in 2020. Verizon throttled firefighters, and has been sued. Santa Clara County fire says the throttling had a significant impact on their ability to provide crisis response and essential emergency services during recent fires. Arstechnica.com says the fire department’s declaration was added to a brief filed by 22 state attorneys general in the ongoing lawsuit over the FCC net neutrality rules overturn. Stay tuned. Even though phones don’t have it yet, the cellular providers have been busily working on building out 5G infrastructure. We have been hearing that AT&T would have some 12 markets on the super fast cellular connection that can carry vast data loads, very soon. Now, AT&T has announced that at least 3 markets will have it by the end of this year. The lucky cities are: Atlanta, Dallas, and Waco, TX. Qualcomm has announced its first 5G modem for smartphones, but it isn’t expected to actually be out and in users new phones until 2019! With cobalt supply iffy, Apple is in talks to buy it direct from miners. According to bloomberg, the cobalt is used in iPhone and iPad batteries, as well as in EVs. Apple wants to ensure that they have enough for their products. They are apparently working on a deal to buy several thousand metric tons of cobalt per year over a 5 year period. Samsung, BMW, and VW are also working to secure long term supplies….BMW is angling for a 10 year contract. An iPhone takes 8 grams of refined cobalt…an electric car over 1,000 times more! The price of cobalt has tripled in the last 18 months…supply and demand, you know! Renault is experimenting with an island totally free of fossil fuels. The island in Portugal, Porto Santo, will have only renewable and independent energy production and use. Solar and wind generators, the Renault Zoe and Kango utility van electric vehicles, home batteries, etch. Engadget.com reports that the more diffuse, less massive installations can be used because the island only has 5400 people plus tourists….so won’t require anything like the Tesla Powerpack mega installation in Australia. Some researchers at University of Warwick have discovered that the lithium-ion batteries used in most electric cars can be recharged up to 5 times faster than they presently are being charged. Engadget.com says the makers have been conservative about charging, due to fear of overheating (which can cause fires and explosions.) The researchers used a fiber optic sensor protected by a chemical layer…it is inserted right into the cell, and can track the temperature precisely. In testing on over 18000 li-ion cells, they were able to quintuple charging times. The increased time does reduce battery life, but the researchers point out that if charging time could be reduced from 25 minutes to 5, it might really jump start e-car purchases. It sounds like Apple’s suppliers have the kinks worked out, and production is really ramping up on iPhone X. Appleinsider.com says Apple analyst Ming-Chi Kuo is predicting 26 million of the hero handset with the OLED screen will be out during the holiday quarter. The KGI Securities maven also says Apple will cut back production of the iPhone 8, which is being cannibalized by the X. The 8 Plus, on the other hand, is outselling it’s smaller brother…a first. There’s been great buzz about VW making a new electric Micro Bus. Now, engadget.com reports that they may build and electric Beetle. They have already been experimenting with a rear wheel drive hatchback e vehicle, the ID…which cranks out the equivalent of 168 horses, and has a 370 mile range. The VW board of management hasn’t voted on it yet, but are expected to release 15 e models…let’s hope one is an e-Beetle! Daimler, parent of Mercedes, has been experimenting with hydrogen fuel cell cars since 1980. Now, they are teaming up with HPE Power Innovations to keep server farms running. According to engadget.com, they will build ‘micro-grids’ inside data centers. With the fuel cells, the centers can run on solar or wind power, but be able to make it at night or when it’s calm without firing up diesel generators to tide them over. The Fuel cell can run as long as there’s hydrogen, and the byproduct is environmentally friendly water vapor. If you’re going to be in the market for an Xbox One S or another one, Microsoft has just announced a price drop to $189 for the 500 gig model with a free game for Black Friday. Theverge.com says that’s 10 bucks cheaper than a 1Tb Slony PS4 Slim without game. Xiaomi of China makes an array of gadgets, that are generally high quality and noticeably cheaper than any competition. They have already been producing smartphones, and now may be connecting with Google to make the next Android One. Thenextweb.com reports that they are reworking their 5.5 inch Mi 5X into basically an Android One. It has a dual cam like the iPhone 7 Plus’ Portrait mode, and has good build quality and battery life. If everything pans out, Google could bring an Android One phone to the US by late this year or early next for $200-$300! Volkswagen has shown their first fully autonomous car, a ‘Level 5’ vehicle, which means no driver required at all. 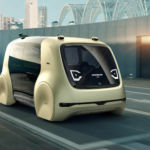 Arstechnica.com says the concept vehicle has opposing sliding doors like a commuter train, couch like seating that faces the middle inside, and NO steering wheel or controls. VW says the vehicle, called Sedric, is designed as either a shared mobility system or could be privately owned like most present cars. It’s controlled by a remote control called the Button…the device summons the car, and identifies the user when the car arrives. It’s electric…with a flat battery back under the floor between the sets of wheels. VW hopes to have some version in service by 2025. In a huge milestone for cord-cutting, Netflix subscribers have passed up the number of people that have a DVR. Arstechnica.com says 54% of US adults have Netflix now, with 53% having a DVR in home. If you throw in other video on demand subscribers, it’s 64% that have either Netflix, Amazon Prime, and/or Hulu. Of those 51% stream shows at least monthly. Your cable company needs some heartburn medicine.